Ebeling was a successful American film, television and commercial producer/entrepreneur. He ran the Ebeling Group – a film production company focused on animation and visual effects. By shear chance, Ebeling went to a fund raising event for Tempt, and (again) by shear chance he found himself sitting across from Tempt’s father and brother. Their conversation turned to the issues of simply communicating with Tempt – at that time the family were using a board with alphabetical letters on it and dragging their fingers across it until Tempt blinked for the correct letter. It was a slow and tortorous method of communicating with the outside world. Ebeling’s first thought was “Hey, why don’t I get one of those Stephen Hawking voice machines for Tempt and his family?“. Ebeling figured if eye movement can be used to communicate, then why not use them to make art? And with absolutely no technical engineering background, he got started. Driven by the questions “If not now, then when? 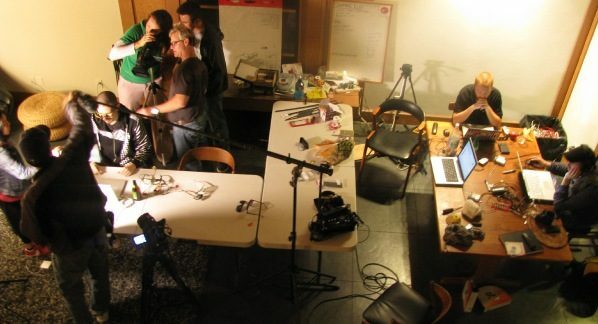 If not me, then who?”, in April 2009, Ebeling flew five engineers from Graffiti Research Lab, Free Art and Technology Lab, and openFrameworks to his Venice beach home in Los Angeles. …until they eventually created the EyeWriter. It is “a low-cost, open source eye-tracking system that will allow ALS patients to draw using just their eyes. The long-term goal is to create a professional/social network of software developers, hardware hackers, urban projection artists and ALS patients from around the world who are using local materials and open source research to creatively connect and make eye art“. The device enables paraysed individuals to interact with the world around them (communicate, create art, etc) using only the movement of their eyes. 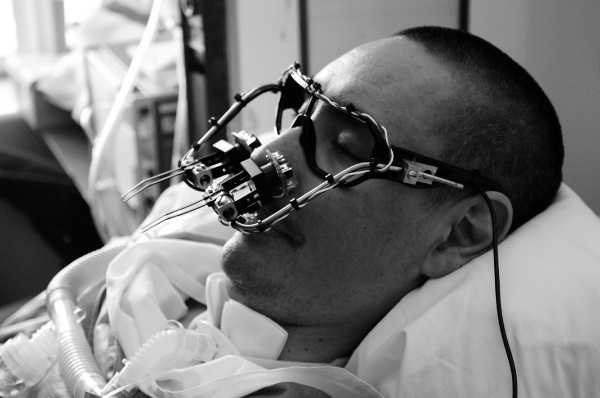 The Eyewriter project was an important step in the setting up of Not Impossible Labs. 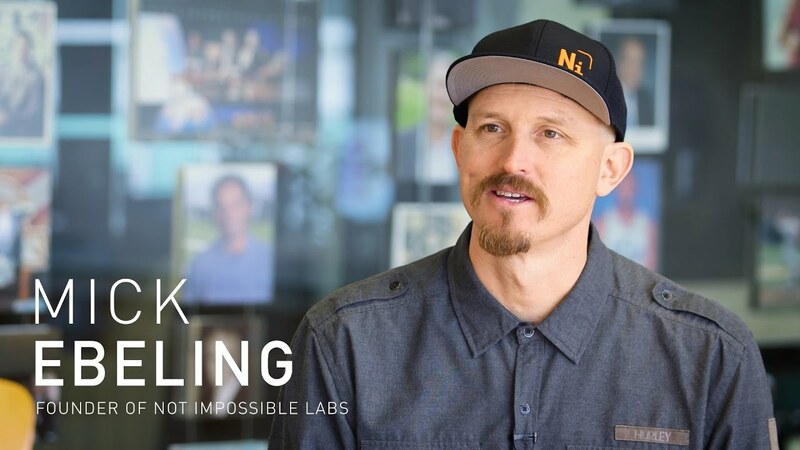 Founded on the principle of “Technology for the Sake of Humanity”, since 2008, Not Impossible Labs has been engineering, programming, hacking and crowd-solving problems. They have been focusing on providing low-cost solutions to issues of inability and inaccessibility. And I know what you are thinking: what does any of this have to do with Parkinson’s? 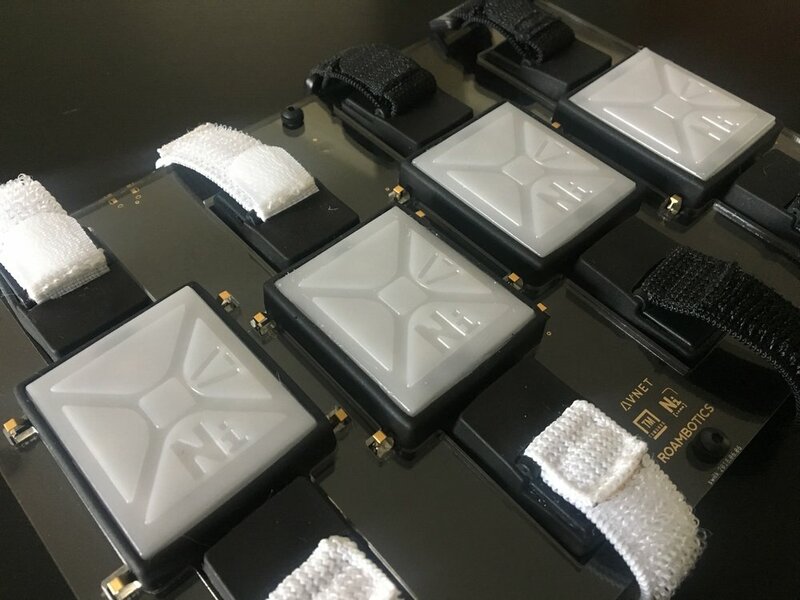 Well, in addition to a host of other interesting projects (such as helping the deaf to ‘hear’ music – click here to learn more about that), Not Impossible Labs has also developed a system called VibroHealth, which is focused on people with Parkinson’s. The VibroHealth system comes with four wearables (which are placed on each of the wrists and ankles). These bands have mini-motors embedded in them that vibrate across a spectrum of rhythms, amplitudes and frequencies. There is also a mobile app which can allow individuals to tune the devices to their needs. The technology is still being developed, but after observing some interesting preliminary results using the system, Not Impossible Labs has apparently initiated a clinical study with the Department of Rehabilitation and Human Performance at the Icahn School of Medicine at Mount Sinai (but I have not been able to find any information about this beyond the group’s website). And cynical readers should understand that this is not the first time vibrations have been proposed for Parkinson’s. 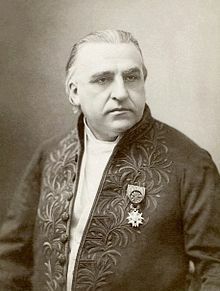 In fact, legendary French neurologist Jean-Martin Charcot (1825–1893) was one of the first to propose ‘shaking’ people with Parkinson’s as a therapy. Charcot observed that people with Parkinson’s often experienced a reduction in their resting tremor following a carriage ride or horse riding. As a result, he developed a ‘vibratory chair’ which simulated the rhythmic shaking of a carriage (any volunteers?). And later there were efforts to develop a ‘vibratory helmet’ to shake the head (no volunteers?). And the sceptical readers out there should know that there is actually a great deal of research backing the idea of ‘tremor attenuating’ devices. There are in effect two types of tremor attenuating devices: Active and Passive. Active devices typically include a sensing and actuating components, as well as a power supply. And these different experimental devices have been applied in different ways to conditions involving tremor, such as essential tremor and Parkinson’s (Click here, here and here to read examples of this research). Parkinson’s is actually a combination of different types of tremors. And those tremors can vary according to different circumstances (resting or during movement), different body parts involved (hands, feet, head, etc), and different frequency of the tremor (from low (4–5 times per second) to high (8–10 times per second)). Title: Consensus statement of the Movement Disorder Society on Tremor. Ad Hoc Scientific Committee. Authors: Deuschl G, Bain P, Brin M.
Journal: Mov Disord 1998;13 Suppl 3:2-23. 1. A resting tremor with the same frequency – This tremor is the most common and it is usually inhibited during movement. 2. A resting tremor of different frequencies – this form of tremor occurs in less than 10% of people with Parkinson’s. 3. A postural tremor with a frequency varying between 4 and 9 times per second. These types of tremor are rare in the overall Parkinson’s population, but are common in the very rigid version of Parkinson’s. 1. Waking up every morning – let me explain: Every day, we rise again from our slumber and we are blessed with another 16-18 hours of opportunity. But because this is a fixed schedule of reinforcement, we have learnt very quickly from a very young age to take it for granted. “Oh’ll I’ll do that tomorrow” we say when a job is left in complete. Why? Because tomorrow is almost guaranteed. 2. Waiting – I am extremely patient when it comes to things that require time (for example, the ageing of a good bottle of wine – I have several that have been down for more than 20 years – #ProbablyVinegar), but traffic jams drive me completely postal! Why? Because tomorrow is NOT guaranteed. As a result of these two things, I am always hugely impressed and inspired by the efforts of others to make a difference in the world, particularly where there is no potential for personal gain. I have shared the example of Not Impossible Labs in this post today solely because I like the story behind it (and it is a similar situation with the Emma watch story – there is a good story behind it). Please understand that I am not endorsing or vouching for either product. Whether the tremor attenuating device technology helps members of the Parkinson’s community and provides a better quality of life, that is for readers to explore and determine for themselves. I have shared the topic here simply because I thought it may be of interest. And hopefully the stories behind the products will help to inspire others to do great things. Following all your posts for couple of years now. Appreciate yours “hard truths”), might be that` why it is valuable. This post had made me think. I was thinking that if you shifting your focus on how make it bearable then you don`t see in foreseeable future cure for Parkinson and you monitor updates professionally and with all required knowledge. As you mentioned in one of your posts as human brain is too difficult to grasp for human being. We can appeal to creator for pray, but what about AI development on that subject? Might be you shed light on that in one of your future posts? Last thing I heard about Emma’s bracelet was about a year ago when it was undergoing further testing . Has there been any progress? What a post on The Science of Parkinson’s ! It is inspirational even though the subject involved is under the spell of one of the most disgusting neurological ailments you can imagine. I have Parkinson’s but many a day when it seems to be winning I amp up the attitude and appreciate life again; PD is my preferred affliction because it is benign compared to ALS and to see the things this young guy can do because he has not quit on life yet and I don’t think he ever will. Back in the 1980s my dad phoned me and said ‘Your mother has been diagnosed. It’s something we have never heard of.’ I said try me and he said ‘It is called motor neurone disease.’ Up to then I had heard of it because David Niven died from it. 2 Years later my mother was paralysed but alive. 16 years after that she died. All that time trapped in a mannequin body. Good luck to this guy I know where you are coming from.